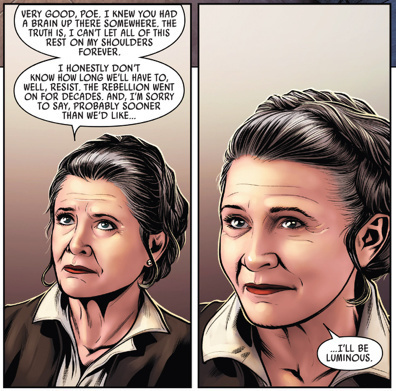 That moment, captured from issue #17 of the Poe Dameron Marvel series, is enough to take your breath away. And from what little we know of The Last Jedi, it’s also the start of something we’re going to see more fully realized in the new movie. It’s the idea that Poe has more to offer the Resistance than merely his piloting skills. The “Legend Lost” story arc (a very aptly and intentionally named story arc, I’d say) doesn’t just set up that dynamic. It also reveals that Han Solo set up the network of scoundrels from which the Resistance is getting its fuel, but that the now-subservient Agent Terex is wiping out that network and setting up Black Squadron for a new trap with their last remaining supplier. It turns into a play on the movie Speed, if you remember that one, where the bus is supposed to blow up if the speed drops below 50mph. Naturally, Black Squadron triumphs and steals back their fuel shipment from the First Order, much to the chagrin of our new baddie, Commander Malarus. And Jess Pava earns the nickname “The Great Destroyer” from the droids back at the Resistance base, when she loses yet another astromech droid as a casualty of war. 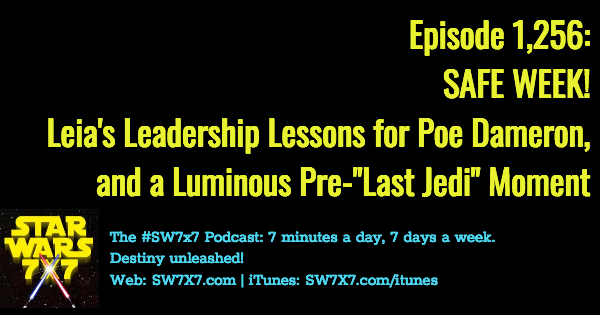 I’m covering the story and that luminous moment on the podcast today as part of our continued “Safe Week.” No more Last Jedi news until the movie comes out, and then I’ll be running dual tracks over the weekend. You’ll have both spoiler-free and spoiler-filled episodes from Friday 12/15 through Sunday 12/17, and then all bets are off starting on Monday 12/18.